Oceana Southampton’s weekly student night, including mash up of BIG club anthems, Live PAs, party bangers and a room full of cheesy classics to sing your heart out! What ever your looking for on a night… We’ve got your Therapy. We’re inviting all of our Halls, so come along to show us what your Halls are made of. Why are there two nights? We are offering two nights for you to attend as a little extra! There are a lot of you as well, so it is always good to spread out the fun across two nights. Is it included in the Master Pass? Yes! This event is exclusive to Master Pass holders, so what better reason to get yours! 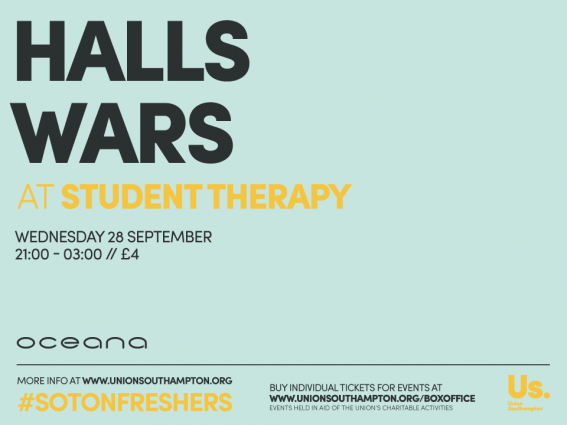 Tickets to all our Freshers’ events are available from the Box Office at www.unionsouthampton.org/boxoffice. You can ask us questions at any time on our official channels and we’ll get back to you.